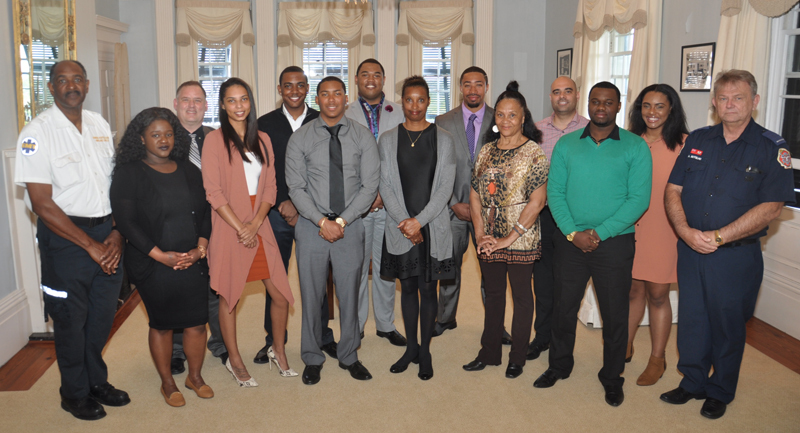 There are twelve new emergency medical technicians [EMTs] the Bermuda College announced, explaining that the group made history as the first graduating cohort of the pilot programme of a partnership between Bermuda College, the Bermuda Hospitals Board, and the Bermuda Fire & Rescue Service. The local programme has also been validated by the National Registry of Emergency Medical Technicians [NREMT], another first, and an accomplishment which Dr. Edward Schultz, Chief of Emergency & Hyperbaric Services at KEMH, described as “ground-breaking”. The Registry provides national certification of standards and competency, and is recognised in every state in the United States. It is the first time that the Registry has been allowed to be used internationally. Update: First row left to right: Instructor – Walter Brangman, Asia Washington, Kidada Robinson, Mahkye Steede, Tanisha Smith, Betty Lambert, Payton Iris and Instructor – Arnold Botelho. Back row left to right: Stephen Gunn, Amani Wears, Lateef Trott, Kalijai Simmons, Jeffrey Borges and Elisha Bailey-Lewis. “This means that Bermuda is now recognised as a designated authorising agency for the NREMT, and that students of the EMT training course offered through Bermuda College are entitled to sit the Basic EMT certifying exam, and if successful gain full NREMT reciprocity in the United States,” he said, crediting the hard work of EMT-Paramedic, David Duperreault, formerly of the Bermuda Fire & Rescue Service. The significance was echoed by BHB Chief EMT Officer Walter Brangman who said, “This programme was a lot of work but has been very rewarding for me. Three of the 12 new graduates have already sat and passed the NREMT exam, allowing them to practice locally, or anywhere in the United States. Two of the students, Mahkye Steede and Armani Wears, have already secured employment at the Bermuda Fire Services. Karen Smith, Programme Coordinator of the EMT course at Bermuda College’s PACE Division credited the teamwork as a main component of the programme’s success. “PACE is always poised to provide customised training leading to certification for local and international programmes,” she said. “The EMT programme is a perfect example of how the College and industry can collaborate to meet the demands of the workforce in a timely manner. The 15-week course will launch its second cohort this Fall, and for more information please contact Karen Smith at Bermuda College.